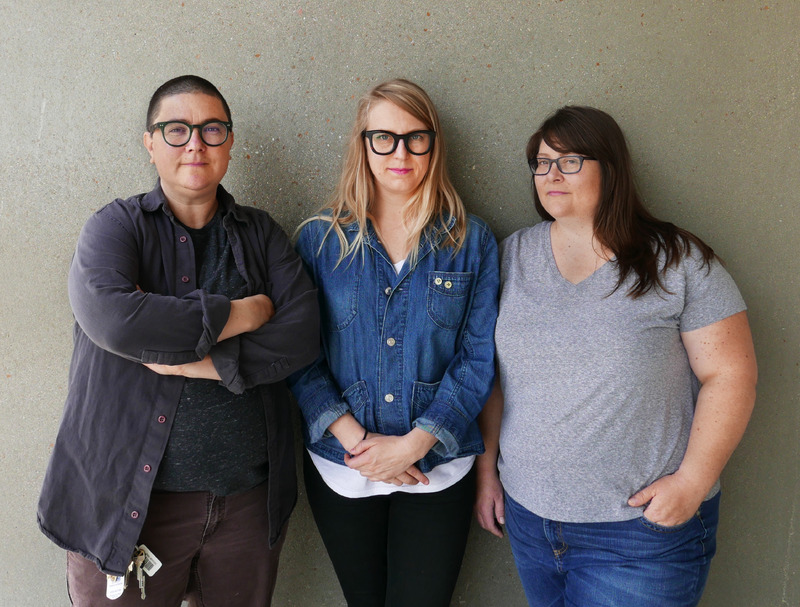 The Visual Arts Center of Richmond will host an opening reception for “I><YOU><WE,” an exhibition of work by Emmy Bright, Jessica Heikes and Leigh Suggs, on Friday, December 7 at 5:30 p.m. This group show is the culmination of three artists’ years-long process of collaborative dialogue, art-making and friendship. Guest curated by St. Louis-based curator Lauren Ross, “I><YOU><WE” is a collective project that softens the boundaries between separate artists and teases out the effects of influence and camaraderie. Ross’ recent work also includes an exhibition of work by New York City-based artist Elissa Levy, “Of secrecy, the violet,” which was on view at VisArts during the fall of 2018. VisArts sat down with Ross during the installation of “I><YOU><WE” to get a behind-the-scenes look at the exhibition. How does it feel to be back in Richmond to curate another show at VisArts? I’m thrilled to be working with VisArts again. I’m a huge fan of the Quirk + VisArts Artist-In-Residence Program, and it’s been very rewarding to be able to guest curate two exhibitions in this series. This exhibition is so different from Elissa Levy’s solo, so it’s a different experience. Actually, I would say that, as a curator, every exhibition and project is unique. Can you provide a bit of background on each of the artists in this show? How is each of the artists’ body of work similar and different? Emmy, Jessica and Leigh live in different cities–Detroit, Kansas City, and Richmond, respectively–where they maintain solo practices that differ significantly from one another. Emmy is primarily a printmaker, Jessica is primarily a sculptor, and Leigh favors drawing and cut paper collages, and each focuses on different subject matter. Despite these differences, they feel a close affinity with each other’s work that is less about media or subject matter than it is connected to ideas, interests and spirit. One common thread is that they are all fascinated with the psychology of relationships, and the boundaries between individuals. It is a theme that comes up in their work, but also in the very nature of this friendship/collaboration hybrid they have developed. Can you talk about how “I><YOU><WE” is the culmination of 10 years of friendship and collaboration? When the three of them met a decade ago they felt an immediate connection, so staying in touch developed organically. At first, the nature of their interaction revolved around sharing ideas and concerns, as they relate to art-making but also life outside the studio. They spoke–at first jokingly and then later with increasing seriousness–about reuniting and making work in dialogue with each other. About two years ago, they made the decision to commit to it, give the project more structure, and have it culminate in an exhibition. So, the last two years have been more intense than the previous eight in terms of working together. But I think their decade-long friendship really is the foundation for everything else. How have Emmy, Leigh and Jessica remained in close dialogue since they met at Penland in 2009? Phone calls? Texts? Email? Skype? All of the above, really. Also, they have reunited twice as a group this year to prep for the exhibition, first at the Penland School of Crafts and later in Kansas City. From your perspective as the curator, what’s the most interesting aspect of the show? It’s the relationship and way of working together that these three artists have formed. They are not a collective, and they don’t collaborate in the most literal sense; in other words, each work in the exhibition is by a single artist. However, they have been making work in tandem through a method of conversation that they fashioned themselves. This involves giving each other “provocations” that take the form of readings, discussions, or art-making assignments. They push each other out of their comfort zones by challenging each other to experiment with new materials, techniques, or even conceptual approaches. And they have developed a level of trust in which they can safely support and challenge one another. The artists are obviously good friends. Does that make this different than other group shows you’ve curated? This exhibition really is sort of an anomaly; it’s not three solos, but it’s not really a group exhibition either. So, yes, the nature of their collaboration makes it different than any other exhibition I have curated.